The bathroom spaces within the leading luxury hotels are defined by two elements: dignified elegance and high-class style. We’re outlining several techniques for achieving that luxury hotel-style bathroom elegance. By decorating the tub space with waterproof pillows, homeowners can create a stylish appeal that assures lasting comfort and offers the allure of euphoric relaxation. Once they’ve finished relaxing in their freshly decorated tub, homeowners will love the feel of plush fabric against their toes when stepping out into the evening air. Shower additions can provide a luxury design appeal alongside practical convenience. Homeowners might consider a curved shower rod that provides a little extra elbow room in the tub, or a dual showerhead for extreme indulgence. It’s an addition that ensures broad water coverage and captivating design elegance. They might not be the first item you consider when you think of the luxury hotel experience, but the largest luxury chains are known for their irresistibly soft towels. 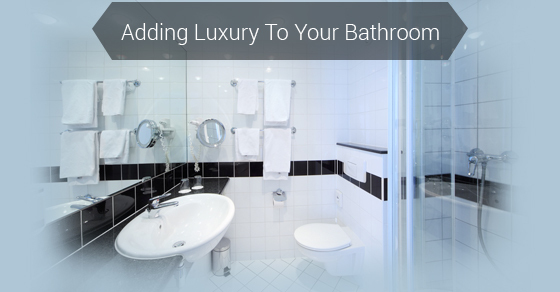 High quality towels can be a cost-effective addition to any luxury bathroom design. Consider adding towels that bring calming colours such as pale green and baby blue to the bathroom area. Homeowners might also consider monogramming their home towels, to add that further sense of personalized style. No luxury bathroom would be complete without high quality toiletries such as bath foams, soaps and shampoos. The high quality products can often be found at affordable pricing for those who complete their research on their favoured products. Adding a customized amenity tray to the bathroom space provides that ideal way to showcase the toiletries available to home residents and guests alike. Turning your run-of-the-mill home bathroom space into a comfortable luxury environment doesn’t have to be a challenging and expensive ordeal. Review the tips highlighted in this article and create a space that whisks you away to a land of exceptional comfort and style. Contact our experts today to learn more home upgrade tips!